ForFarmers have launched a new C16 fat product to help with low butterfat following success at the company’s ‘Nutrition and Innovation Centre’ (NIC) near Lochem in the Netherlands. 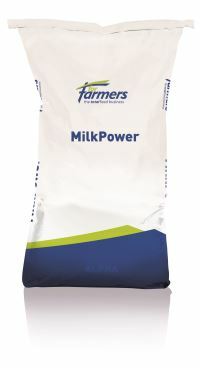 MilkPower FF160 was trialled against other fat products and found to increase butterfat content more than any other, while having a positive effect on milk yield. Palmitic acid (C16:0) is used in milk fat synthesis to a large extent and therefore fats with mainly C16 have a large effect on milk fat content. Cows in one trial were mid lactation 180 DIM while at the other were in early lactation only 80 DIM. Adding bypass fats increased milk fat yield from all rations, however the most effective for increased butterfat content was MilkPower FF160. Milk fat is affected by a number of dietary factors including fibre digestion, rumen activity and fat content. Ensuring cows have enough structural fibre e.g. including hay or straw and using digestible fibre energy feeds will help, however ensuring there is enough of the right type of fat in the diet also plays a part. First cut grass silage has a lower fibre and high sugar content than second cut which tends to reduce milk fat and is why we see the seasonal depression from November through to January. MilkPower FF160 will therefore be particularly useful to farmers who want to maintain butterfat content.